Is it that decisions are sometimes difficult to make? What if you make the wrong decision? Then you can change it to a better one. 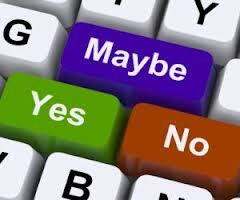 Even by not deciding, you are making a decision. This entry was tagged Decisions, Maybe, No, Yes. Bookmark the permalink.